The Apollo–Soyuz Test Project (ASTP) (Russian: Экспериментальный полёт «Союз» — «Аполлон»,	Eksperimantalniy polyot Soyuz-Apollon, lit. "Experimental flight Soyuz-Apollo"), in July 1975, was the first joint U.S.–Soviet space flight, and the last flight of an Apollo spacecraft. Its primary purpose was as a symbol of the policy of détente that the two superpowers were pursuing at the time, and marked the end of the Space Race between them that began in 1957. This one only expands the number of 60's and 70's spacecraft that Dragon and Cyber-hobby have produced over the last year or so. Judging from the way these disappear from shelves, the program must be doing very well indeed. The Apollo in various forms has been the subject of a number of kits from the Dragon clan so I'll limit my commentary to the Soyuz. First off, only about half of it is actually injected styrene. 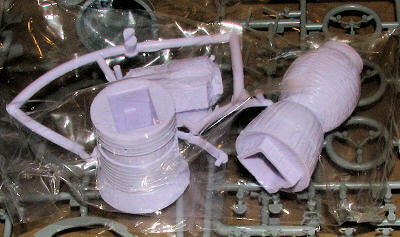 The main body of the Soyuz is made from some very thick and heavy material that is a light lavender. It is also quite flexible as you can see of the curved sprue in the bag in the image. Now this could be a thick vinyl or even very thick DS plastic. I just do not know. I am also not sure why this was not done is standard styrene, as its weight will surely make it difficult to get a good bond between it and the Apollo, especially considering how it is supposed to fit on the stand. 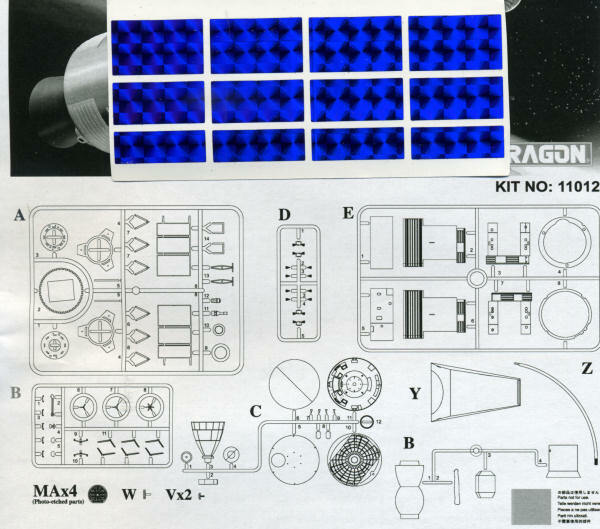 Anyway, all the various attachments to the Soyuz are made of standard styrene, including the solar panels. Dragon includes blue stickers to place on these panels that look quite convincing. A sturdy display stand is included. The full list of features is given below. Those who are building a space collection in 1/72 are going to want to add this little gem to their collection. 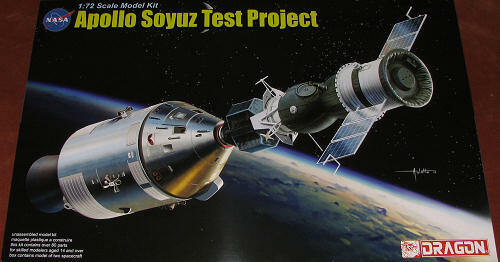 I'll be interested in hearing how building and painting the Soyuz turns out.